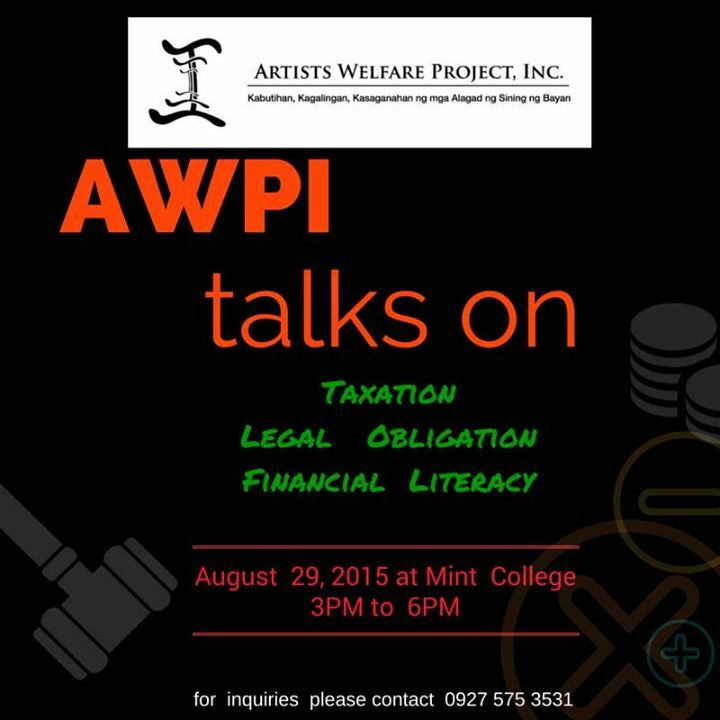 The Artists’ Welfare Project, Inc. (AWPI) invites artists and cultural workers to an afternoon talk about Taxation, Legal Obligation and Financial Literacy to be held at Mint College, 2F CIP Bldg, McKinley Hill, Campus Avenue, Taguig on August 29, 2015 from 3PM to 6PM. The talk is part of AWPI – Education Committee’s series of educational activities to raise awareness and empower Filipino artists and cultural workers. AWPI Membership is open to Filipino artists and cultural workers from all disciplines. You can apply here. This entry was posted in Advocacy and tagged Actors' Equity, Anakpawis Partylist, art education, Art Fair, artist’s talk, Artists Guild, Artists Rights, Artists Solidarity, Artists Union, Artists Welfare, Arts, Arts Management, AWPI, Bayan Muna, BIR, Cong. Neri Colmenares, Filipino Artists, Financial Literacy, Legal Obligation, mass education, MINT College, Pag-ibig, Sen. Grace Poe, Taguig, Taxation. Bookmark the permalink.